I first encountered the writing of CJ Box when he came to our bookstore to sign his previous book Breaking Point. When I realized it was about a WY game warden named Joe Pickett, I was not very interested. Guns and trucks, hunting and horses, boots and Stetsons aren’t really my thing. But before I knew it, I was sucked into the mystery and stayed up way too late to find out what happened. Then I realized that I enjoyed CJ Box’s writing and his characters. Sometime in the last 6 months, I’ve read over half of his books- cowboys notwithstanding. 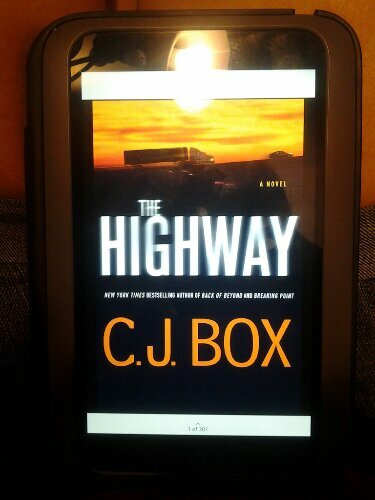 CJ Box summarized The Highway as “a serial killer long-haul trucker.” Obviously it gets more involved than that, but the premise is just as frightening as it sounds. This book is part of a three book series starring a Sheriff named Cody Hoyt. However, as the reader, you spend a lot of time with the thoughts and actions of his professional partner, Cassie Dewell. For all the apparent machismo of his books, CJ Box writes women’s voices very well. Cassie is flawed but strong, and I would happily read more books with her as the lead. As a bonus, CJ Box excells at decribing the breathtaking scenery where his stories take place. You really haven’t read about a sunrise in Yellowstone Park until you’ve read his description. If you always wanted to read mysteries about game wardens and sheriffs in our Western states, these books are perfect for you. If you never wanted that, but like a good mystery, give CJ Box a try. Like me, you might find yourself suprised to like his books. This entry was posted in Fiction and tagged book review, books, fiction, mystery, serial killer, truck stop, western. Bookmark the permalink.